Recent use of topographic maps for further analysis of Pluto’s intriguing surface reveals new details about Pluto’s ‘heart’. Pictured below is the now famous heart-shaped feature that was recently discovered to contain icy plains. Now, the region is found to be an average of two miles below the surrounding elevation, something that cannot be entirely explained as of yet. 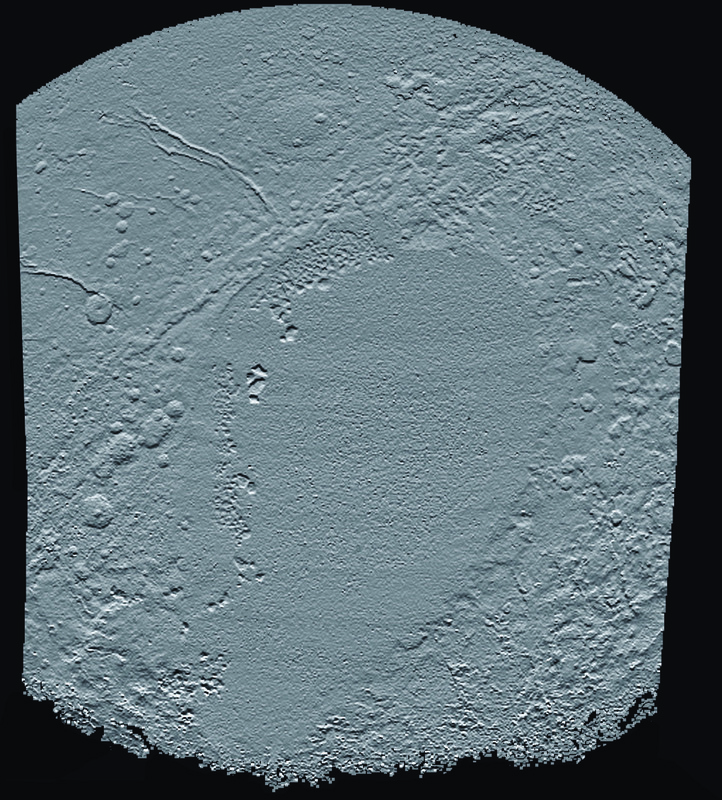 The gray topographic map below covers about four miles and shows the low elevations of the heart’s left lobe, informally named Sputnik Planum after Earth’s first satellite, in comparison with the surrounding area. Along the heart’s western edge where more dense solid nitrogen deposits are located, water ice blocks appear as though to be floating. Stereo images taken during New Horizon’s July 14, 2015 flyby were digitally analyzed to form these maps, making it possible for Pluto’s varying elevations to be studied. To estimate elevations, mapping tolls measure a feature’s parallax at differing times, which is to say the difference in the its apparent relative positions which tells scientists what the height displacements are. Another advantage to using digital maps is that the terrain’s illumination can be adjusted in order to focus on individual features more easily. The map below is artificially lit from the South, whereas when the image was taken, the terrain would have been northerly lit by the sun. Topographic maps will continually be enhanced and be of beneficial use for scientists busy unveiling Pluto’s long kept mysteries.